Setting up a new task. To begin adding a task, go to Property Maintenance and select a property. Step 3: The Add New Task window will appear as pictured below. Step 4: Enter a Task Name. This field is for internal use only, it will not show up for the customer or the officer. Step 5: Select an Issue Type. This is what will show up in the issue monitor, reports, etc. Make sure the issue type is a descriptive title of the task being assigned. Step 7: Select the Property Address. Step 8: You'll have the option to assign this task to a unit/suite or a location. This is not a required field. Step 9: Select a Task Time. 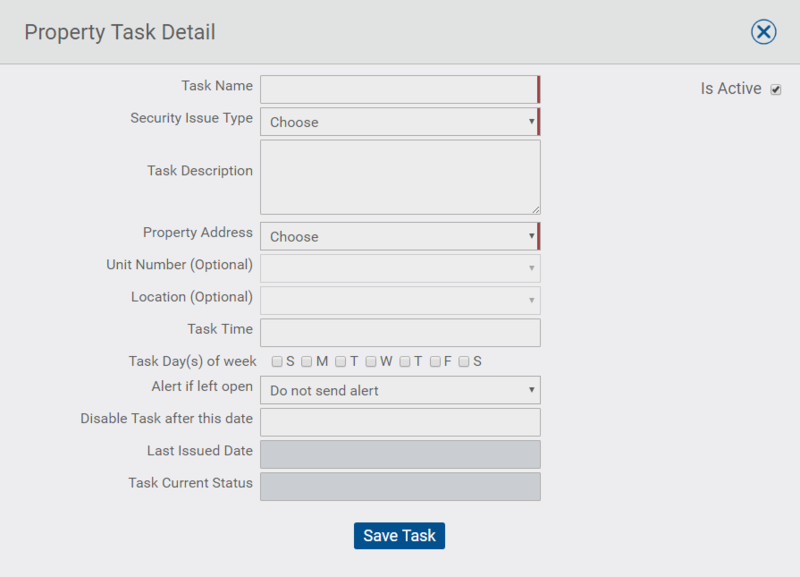 This is the time the task will be automatically sent to the property/handheld. Step 10: Select the Task Day(s) of Week. These are the days of the week in which the task will be sent to the property/handheld. Step 11: Select the Alert if Left Open field. This allows certain users to be alerted when a task is overdue. Use this feature if you'd like your supervisors or dispatch to be notified when an officer fails to respond to a task within a certain time frame. To learn more about enabling this alert, click here. Step 12: Select a Disable Task After This Date (optional). This is not required. Selecting a date in this field will cancel this task after a certain date. This allows you to schedule a task to go out temporarily. Leaving this field blank will cause the task to run indefinitely. Step 13: Click Add Task.